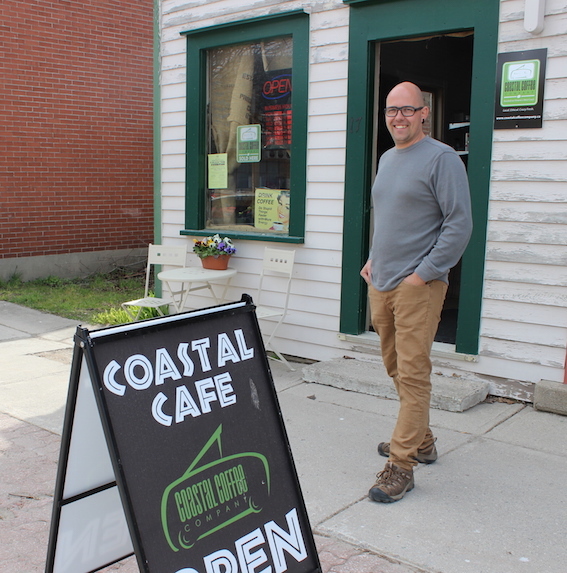 Fuelled with a cup of coffee and the voice of Stuart McLean’s Vinyl Café for company, I headed out for a day trip to some of my favourite stops in Huron County. Today is a food-themed tour, a gathering of locally produced food to stock my fridge. Stops along my three-hour, 120-km trip take me from Goderich through Hensall, Zurich, Dashwood and back to my lakeside home. As I drive, the sun throws its warmth across the countryside and farm machinery massages the winter-worn earth, getting ready for another season of growing. Rows of mailboxes mark the ends of country laneways, hand-painted names clustered along family-owned farms. Small cemetery plots give evidence of lives lived. Laithwaite Apple Park, 35563 Huron Rd. (Hwy. 8), just east of Goderich. Hours: Monday to Saturday, 9:30 a.m. to 5 p.m.; Sunday, noon to 5 p.m. 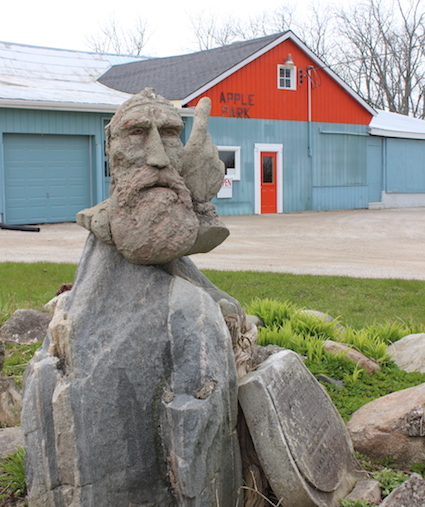 This year-round farm gate store is tucked behind a scattering of sculptures George Laithwaite (1873-1956) fashioned from fieldstones, metal and cement. Inside the store, I usually have a chat with Ed Laithwaite about topics ranging from pesticide use to the disappearance of fruit and vegetable farmers in Huron County. Then I’ll buy apples, potatoes, strawberries, asparagus, onions, turnip or whatever happens to be in season. At the height of harvest, the shop overflows with squash, gourds and pumpkins for children to pick through. Today’s purchase: Courtland apples. Metzger’s Meat Products Inc., 180 Brock Ave., Hensall. Hours: Monday to Friday, 8 a.m. to 6 p.m.; Saturday, 8 a.m. to 3 p.m.; Sunday, closed. The freshly butchered meats, rows of deli meats, display cases of frozen meats and variety of cheese hold so many possibilities for a backyard barbecue, intimate dinner or even a breakfast start to the day. Purchases by other patrons in the store include London broil, smoked pork chops and breakfast sausages. Today’s purchase: Tuscany turkey and prosciutto salami deli meat. Rader’s Homestyle Market, 38110 Zurich-Hensall Rd., Zurich. Hours: Monday to Friday, 9 a.m. to 6 p.m.; Saturday, 9 a.m. to 5 p.m.; Sunday, 11 a.m. to 4 p.m. (There is also a store in on Stanley Street in Goderich. )The market’s namesake, Jerry Rader, is out front today, preparing the yard for the summer season. He begs off a photo, and refers my questions to his children, who now run the business. This is a neat store to poke around, with racks of giftware like scarves, purses and glittering slippers surrounded by frozen pies and gravies, fresh salads and daily lunch features. At the height of summer, the gardens will be bursting with flowers, there will be entertainment on the lawn – under that tent Jerry is putting together in the photo – and rows of local produce will be on display outside the store. Today’s purchase: A small container of baked beans. Coastal Roastery Café, 17 Goshen St. N., Zurich. Hours: Thursday and Friday, 8 a.m. to 3 p.m.; Saturday, 8 a.m. to 1 p.m. (Watch Facebook and Twitter sites for expanded spring hours.) 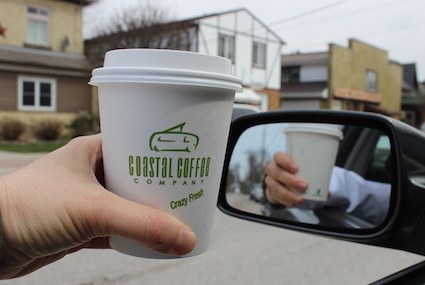 I’ve followed the owner of Coastal Coffee Company, Ben Gingerich’s, story from its start when he roasted coffee beans in a popcorn maker and used his wife, Brianna’s, hairdressing clients to test his small batches of coffee to their success in marketing the fair trade, locally roasted coffee in retail outlets and restaurants throughout Southwestern Ontario and at farmers’ market across the county. But I’d never been to his new 1,400-square-foot storefront and roastery in Zurich. Today’s purchase: A cup of micro-batch Nicaraguan medium roast coffee for the rest of my trip. 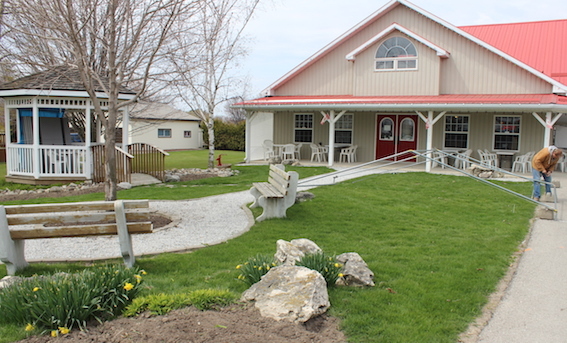 Hayter’s Farm, 37467 Dashwood Rd., Dashwood. 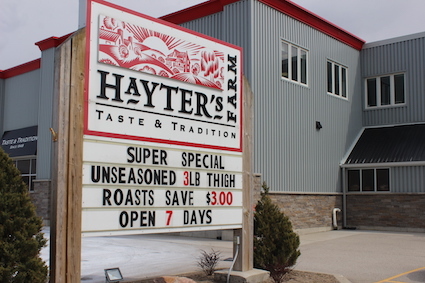 Hours: Monday to Saturday, 9 a.m. to 6 p.m.; Sunday, 11 a.m. to 4 p.m. Hayter’s is a delightful one-stop shop just on the outskirts of a small rural village. It’s delightful because on one side is frozen and fresh turkey products of all kinds, from breasts to sausages to schnitzel, along with frozen pies, sauces and berries, then on the other side is the LCBO outlet. All you need for an early barbecue in one stop. Today’s purchase: Turkey thigh roast and spinach & cranberry turkey burgers. Okay, I said there were five favourites. However, I took a wrong turn and discovered a sixth: The Whole Pig, 37871 Dashwood Rd., Dashwood. Hours: Monday to Friday, 9 a.m. to 4 p.m.; Saturday and Sunday, call ahead to 519-237-3255 or cell, 519-851-3327. This shop is set up in a shed on the farm, with pepperettes and pepperoni in a fridge at the front entrance, an information table, and all the good stuff in a walk-in freezer. Just have a look over the lengthy order form, and a staff member will retrieve the product for you. My purchase: A package of four Chilly Hot Sausages.